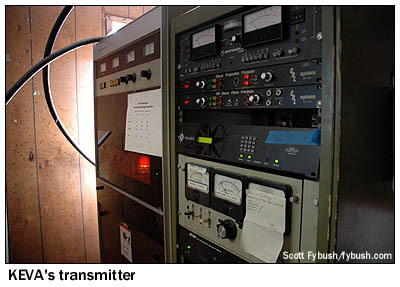 It's become an annual tradition here at Tower Site of the Week - load up the tape decks and the DVD recorders and the cameras, line up a bunch of station tours, gather a few friends, and hit the road for as much as two weeks of in-depth exploration of the radio and TV environment in some scenic part of this great nation of ours. Then we come home and share it all with you, in pictures here on fybush.com and in audio (of legal IDs) over at our sister site, tophour.com. "Big Trip 2007" covered parts of Utah, Wyoming, Idaho, Montana, Washington and Oregon over two weeks in late August and early September, and in this fourth part of our recap, we wrap up our visit to the Salt Lake City market with one more in-city site and several more at the extreme fringes of the sprawling metropolis. 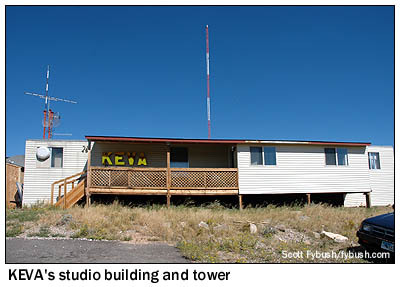 First, the in-city site: KSOP-FM (104.3 Salt Lake City) and KSOP (1370 South Salt Lake) are among that rarest of breeds - independently-owned mass-market stations that are still surviving, and thriving, in a big market. 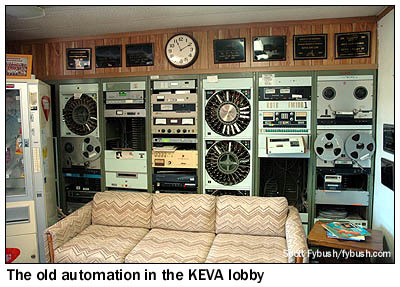 The Hilton family put KSOP(AM) on the air in 1955, followed up with the FM signal in 1964, and they've been playing country music ever since. 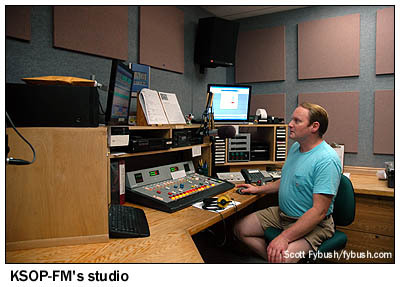 KSOP-FM (the calls stand for Salt Lake, Ogden and Provo) claims to be the first FM country station in America; it also boasts an airstaff with incredible longevity. Former morning man "Country Joe" Flint stayed at the station for 34 years; his replacement, Bill Buckley, has logged 18 years there, while weekender Larry Hunter has been at KSOP more than 40 years. 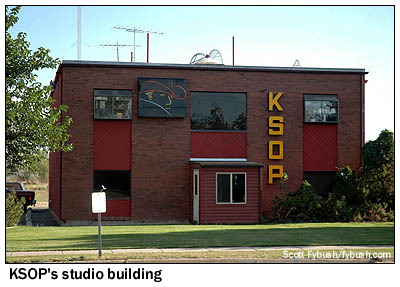 The KSOP operation lives in a compact two-story building in West Valley City, at 1285 W. 2320 South, just east of Redwood Road. 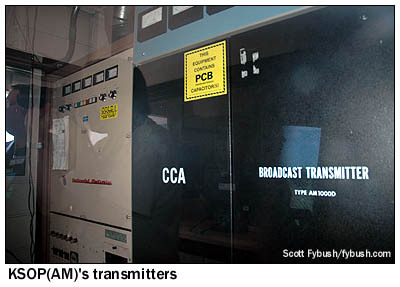 The studios and AM transmitter are on the first floor, lined up down one hallway that leads back from the front lobby, with the AM transmitter room just across the tiled hallway from the studios. 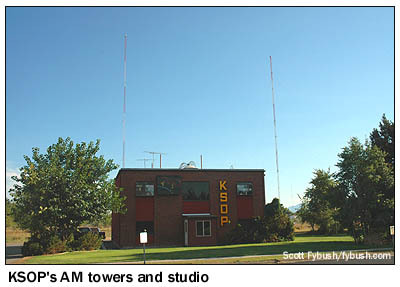 KSOP(AM) runs 5000 watts, non-directional, by day, then uses both towers here for a 500-watt night signal; the FM, of course, is up at Farnsworth Peak with most of the other big signals. Having seen (and showed you) pretty much everything there is to see, site-wise, along the Wasatch Front, we took the opportunity to head east on I-80 up into the mountains, turning off at scenic Park City to check out the local community station. 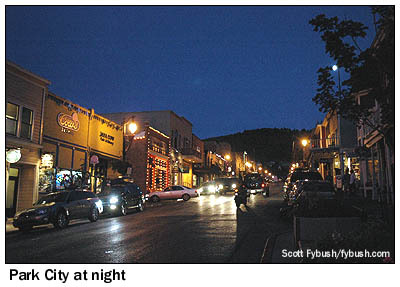 Park City, of course, has become a hot spot for Hollywood with the rise of the Sundance Film Festival held here each winter, but at heart it's still a ski town, and on the warm August evening when we drive up, it's a pretty quiet town. 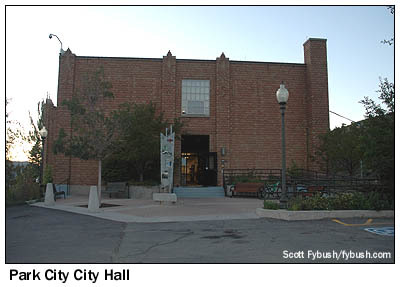 On a hill above Main Street, we find Park City's City Hall, and after some poking around the long hallways inside, we find our way to KPCW (91.9 Park City), which has been on the air here since 1980, offering a mix of NPR programming and local news, music and talk. 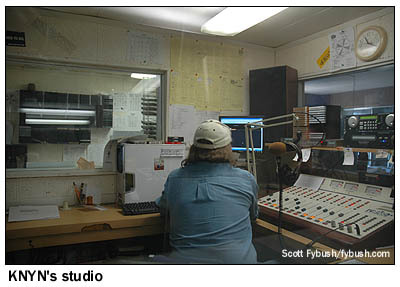 Even late into the evening (and unannounced, yet), a knock on the door quickly turns into a tour of the station, which includes not only a cozy air studio but also a talk studio that originates the "Midday Utah" show heard here in Park City and on sister station KCPW (88.3) in Salt Lake City. 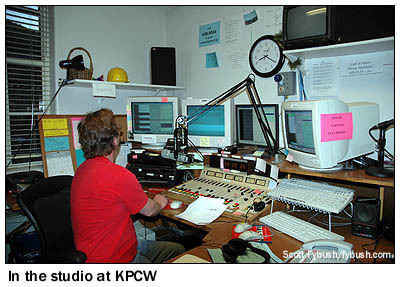 There are some changes on the way here in the near future - KPCW plans to move into a nice new studio space a few blocks away, and after some financial issues in recent years, it's selling the Salt Lake stations and focusing on the Park City operation. "Want to go see the FM site? ", asks Michael as we head outside after the tour. You bet we do - and after a stop for lunch at a local burger joint, we're soon headed uphill on the east side of Evanston, pointed up the dirt road that leads to the top of Medicine Butte, 8600 feet above sea level. Most of what's up here is two-way and translators, but there are two (nominally) full-power FMs, too. 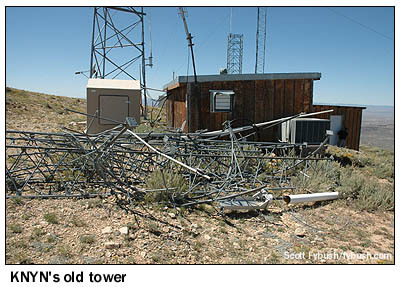 KNYN used to be a 27 kW class C1 facility up here, serving a big swath of southwestern Wyoming and adjacent Utah, but its old tower collapsed in 2005, and since then it's been running under Special Temporary Authority at extremely reduced power, making it not much more than a local Evanston station. 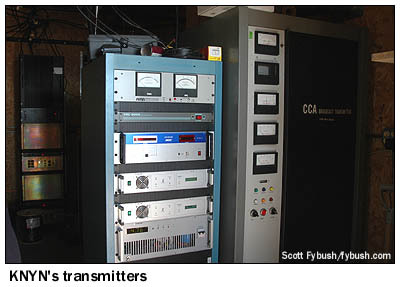 See that one-bay vertical antenna on the tower just to the left of the transmitter building? 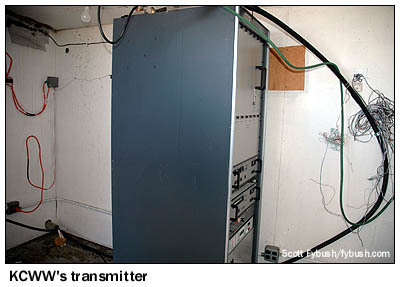 That's KNYN's current antenna, and that CCA transmitter in the shack is long silent, with a 500-watt Nicom transmitter keeping "Magic 99" on the air for now. This is a temporary setback for KNYN, and the reason can be viewed off in the haze to the southwest. 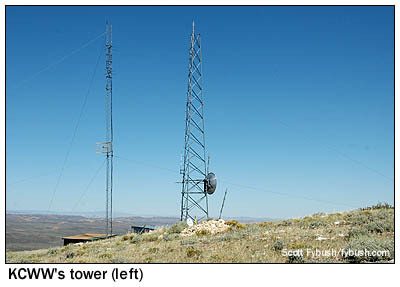 Somewhere out there in the Uinta Mountains is a mountaintop site called Humpy Peak, and up there on Humpy is a massive master FM antenna site that serves six FM stations already, with construction permits and applications for several more to join them. 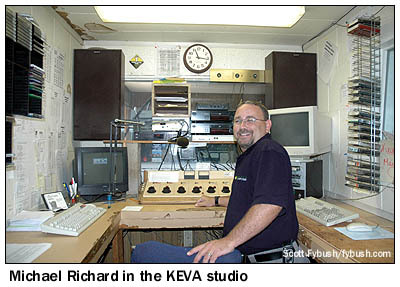 KEVA's former FM sister on 106.1, now KBMG, is one of those stations; KNYN will eventually be another. What's the appeal of Humpy Peak? Simple - while it's terrain-shadowed from Salt Lake City itself, it's close enough that the predicted 60 dBu contours of class C signals on Humpy cover most of the Wasatch Front's population - and it's just far enough from Farnsworth Peak to allow class C signals to be dropped in on second-adjacent channels to the main Salt Lake FMs. 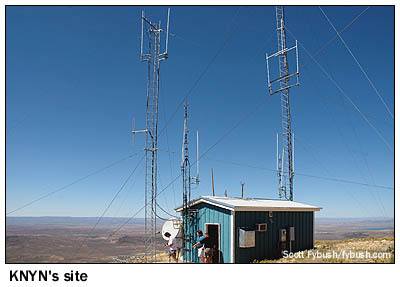 There's one more FM up on Medicine Butte: in 2005, KPCW added a rebroadcast signal up here. KCWW (88.1 Evanston) runs 92 watts from its two-bay directional antenna on the back side of the butte, providing a nice signal to Evanston and vicinity. So that's it for anything that can even remotely be considered part of the "Salt Lake" market, though we'll return to northern Utah at the very end of our trip for a quick swing through Logan. First, though, it's north to Montana - don't miss the towers of West Yellowstone and Bozeman, coming next week here on Site of the Week. And don't forget to join us over at sister site Tophour.com on Wednesday for a whole bunch of IDs from Evanston and the Humpy Peak FMs! Tower Site Calendar 2008 is almost sold out! Visit the Fybush.com Store now and get your calendar now!